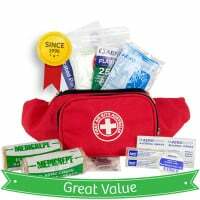 This popular general purpose First Aid Kit is for most situations. It is compact yet full of essential first aid items that will not weigh you down. The K160 First Aid Kit is dust proof with an internal plastic covering of all the contents. The K160 is great for bush walking, adventure races, security work, camping and many more outdoor activities that require a dust proof and water resistant First Aid Kit. What about adding a Snake Bite Kit? Buy a Kit but ensure you know how to use it. First Aid Training saves Lives ! K150 Compact First Responder Softpack - Buy One Get One Free!